The prime function of Hardfacing materials is to protect a component or other material against the forces of wear. Most hardfacing alloys are iron, nickel, or cobalt-base and can be used in a variety of forms including powder, solid welding rods or wires and tubular rods or wires. Hardfacing is the application of a hard, wear-resistant material to the surface of a component by welding, thermal spraying or a similar process, mainly to reduce wear. Hardfacing is used on original equipment, as well as for the repair of worn components. Hardfacing consumable materials are acceptable in different forms, such as powder, solid welding rods or wires and tubular rods or wires. Hardfacing materials include a wide variety of alloys, carbides, and combinations of these materials. Conventional hardfacing materials are normally classified as steels or low-alloy ferrous materials, high-chromium white irons or high alloy ferrous materials, carbides, nickel-base alloys, or cobalt-base alloys. A few copper-base alloys are sometimes used for hardfacing applications, but for the most part, hardfacing alloys are iron, nickel, or cobalt-base. Nonferrous hardfacing alloys are used either for high resistance to specific types of wear (other than abrasion) or for wear resistance (including abrasion) in environments that are too corrosive or beyond the service temperature of ferrous alloys. The cobalt-base alloys and bronzes are particularly resistant to galling and to those wear processes involving micro-fatigue as the degradation mechanism (such as cavitation erosion). The cobalt-base alloys also possess high resistance to deformation at temperatures in excess of 750°C (1380°F). 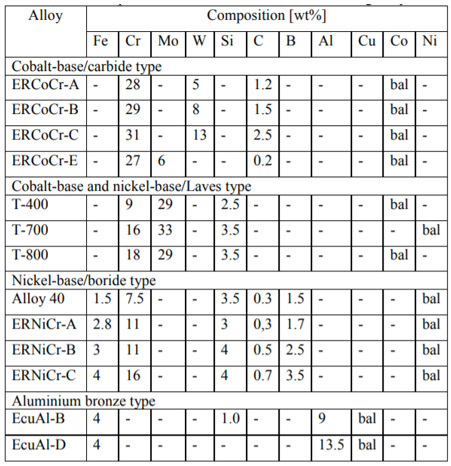 Typical compositions of the nonferrous hardfacing alloys are presented in Table 1. 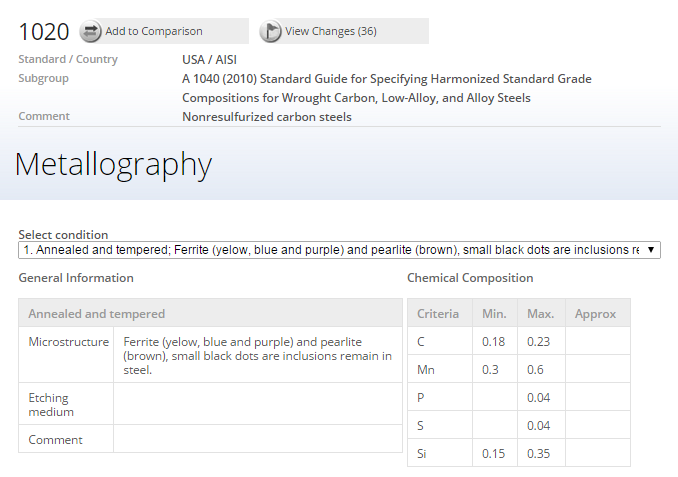 The main difference between the various cobalt-based/carbide-type alloys is in carbon content (hence, carbide volume fraction, room-temperature hardness, and level of abrasion resistance). Chromium rich M7C3 is the predominant carbide in these alloys, although tungsten rich M6C is evident in those alloys having high tungsten content, and chromium rich M23C6 is common in the low-carbon alloys. 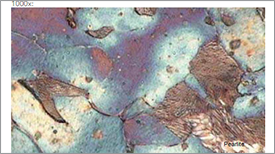 Optical micrographs of ERNiCr-A, ERNiCr-B and ERNiCr-C hardface alloys are presented in Figure 1. 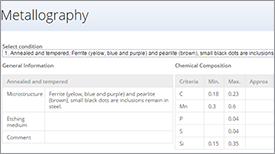 In case of ERNiCr-A and ERNiCr-B alloys, microstructure variations from the first to the third is significant in ERNiCr-C alloy. 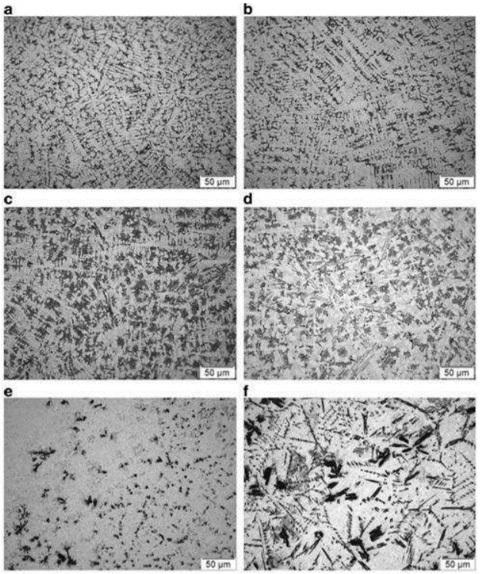 All the ERNiCr-A alloy consist of a dendrites’ microstructure with the solid-solution phase forming the matrix (Fig. 1a–b). 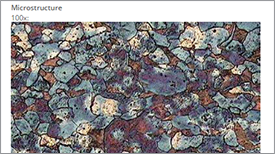 For the ERNiCr-B alloy, the microstructures of the first and second layers resemble that of the ERNiCr-A alloy. However, in the third layer of the ERNiCr-B alloy, some isolated primary precipitates of blocky boride and needle-shaped carbide are also present (Fig. 1d). 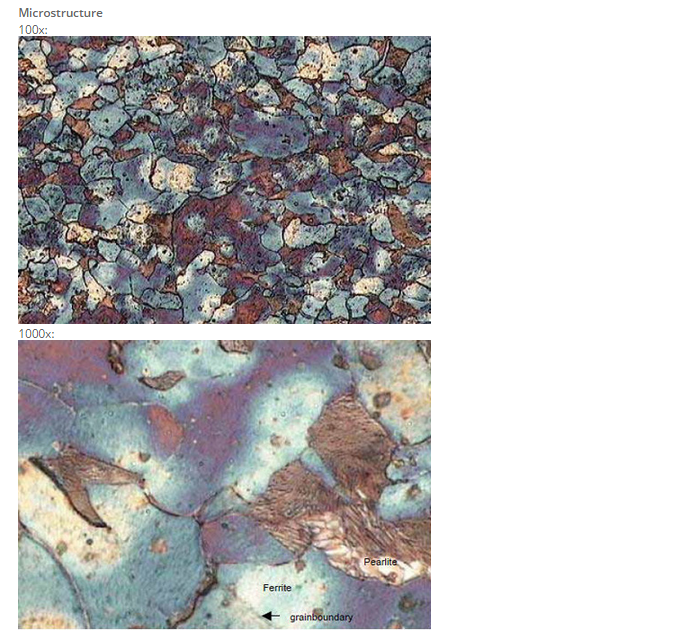 Microstructures of different layers of ERNiCr-C deposits (Fig. 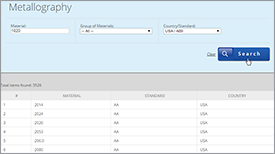 1e–f) are significantly different from the other two grades. The first layer of the alloy consists of fine dendrites as well as few isolated blocky precipitates whereas the third layer consists of large blocky borides and needle-shaped carbides. Size, distribution and morphology of these precipitates also differ in each layer. 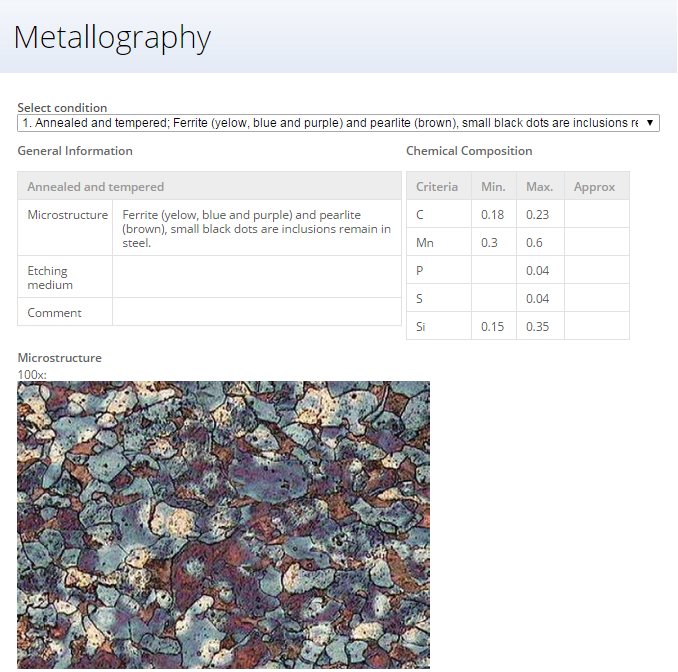 The first layer alloy consists of predominantly an intimate fine mixture of matrix and eutectic precipitates with some isolated blocky precipitates. Large blocky or elongated precipitates are absent in the first layer. In the second layer, a mixture of fine dispersed eutectic precipitates and large blocky precipitates are seen. In the third layer, eutectic precipitates are absent, only large blocky precipitates and elongated and branched precipitates with fish bone morphology are seen. 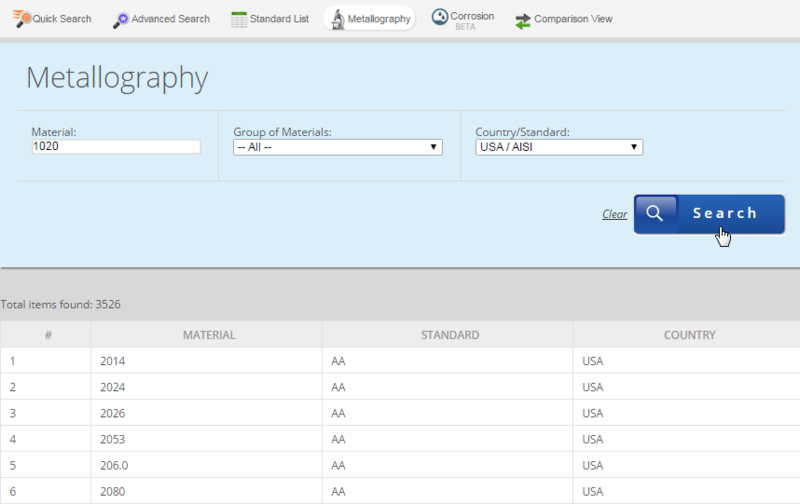 Hardness values for cobalt-base/carbide type alloys range from approximately 40 to 55 HRC. 4. Surface hardening of steels-Understanding the basics, ASM International, 2002 ASM International, J.R.Davis, editor, ISBN: 0-87170-764-0; DOI:10.1361/shos2002 FM. U Total Materia bazi se nalazi više hiljada metalografskih snimaka poreklom iz različitih zemalja i standarda. Korišćenjem kartice Metalografija u meniju možete izabrati materijal koji Vas zanima iz liste materijala koji sadrže metalografske podatke. Metalografske podatke možete naći i kroz našu standardnu Brzu pretragu, a svi dostupni podaci biće prikazani listom podgrupa za odabrani materijal. Jednostavno unesite oznaku materijala u polje Materijal, odaberite standard, ako je poznat, pa kliknite Pretražite. Opšte informacije o mikrostukturi možete videti zajedno sa odgovarajućim hemijskim sastavom za odabrani materijal. Za određene materijale postoje metalogafski snimci pri različitim uvećanjima. Možete odabrati druga stanja iz padajućeg menija Izaberite stanje da biste videli metalografske snimke iz drugih procesa i pri različitim vidovima termičke obrade. Imate priliku da isprobate Total Materia bazu podataka. Pozivamo Vas da se pridružite zajednici od preko 150,000 registrovanih korisnika kroz Total Materia Besplatan demo.